2. Add the onions, tomato, 1/4 tsp saunf, cumin seeds, peppercorns, coriander seeds, dal, gasa gasa, cloves, cinnamon, ginger, garlic, green chillies and dry red chillies. 3. Stir-fry for a minute or two. 4. Remove and grind to a smooth paste. 5. Heat 2 tsp oil in the pan. 6. Fry the mustard seeds, saunf and curry leaves for 30 to 45 seconds. 7. Add the green peas and cook until half done. 8. Then add the paneer, ground paste, turmeric powder and salt. 10. Pour 2 cups of water and bring to a boil. 11. When the peas is cooked and tender, add the ground coconut. 12. Add the eggs and cook until the kurma starts to thicken. 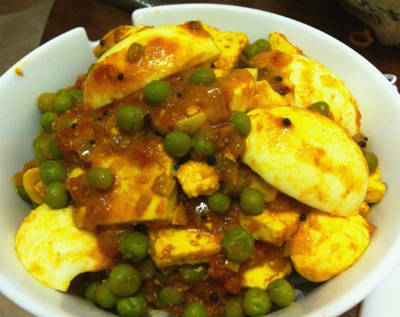 Feel free to comment or share your thoughts on this Paneer Egg Peas Kurma Recipe from Awesome Cuisine.